I know along the way of parenthood for me, I've documented which products I love, those I couldn't live without and the ones I most certainly didn't need. They're usually pretty relative to what stage my sons have been at, which is great but doesn't exactly give a true reflection of my all time 'must haves' as a parent. I am a mum of two, so I've tried and tested my fair share of baby products, by no means am I an expert or anything close to but I have a blog and I'm a parent, so of course I'm going to share with you the things that I think will make life a whole lot easier if you're raising your own Brady bunch. First up, is a product I always forget about when it comes to recommendations, yet it's one we use every single day. Nappies, Little Angels nappies. I will quite happily drive a good half an hour out of my way, to visit an Asda and purchase these nappies. The obvious reasoning is the prices, they're incredibly affordable and if you're a family with more than one in nappies then these will be very kind on your purse strings. However, that's not what draws me to them time and time again it's the durability. 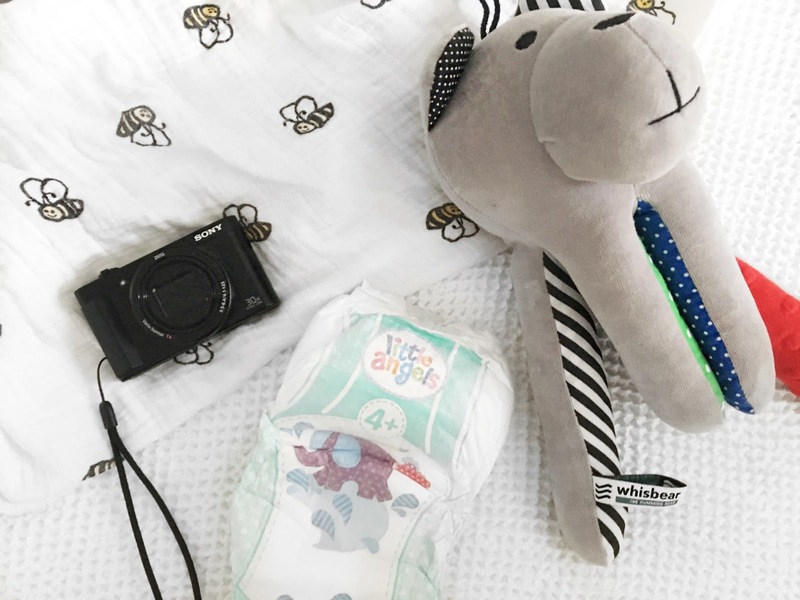 Patrick has lasted flights (and we all know how cabin pressure sends nappies) long car journeys, serious poo-namis, and everything else with his bottom firmly wedged into the plush lining of Little Angels nappies. That's no joke, they are without a shadow of a doubt so much softer on skin than Pampers, which we naively used for years with Noah, it's easy to assume because something is the leading name brand that you must have that for your child, but I'll happily admit we were wrong. Little Angels trumps the lot, (excuse the pun) and is without a shadow of a doubt, our top must have baby product. White noise, every baby brand and their dog seem to have their own version of a white noise machine, so of course, we've put a fair few through their paces though a winner is clear - the Whisbear. I think the secret for us and it is for most parents who find the magic in white noise, is both starting it easy and being consistent. Patrick has used white noise to soothe him now since he was around the three month mark, before then we wasted our phone batteries every single night using a 12 hour Youtube soundtrack to do the trick. We have a lot to be thankful for in regards to the Whisbear, it's saved our tired eyes, sanity and harmonious household by gently whisking Patrick off to the land of nod. I haven't and wouldn't be without it. Did I mention it's incredibly stylish too? One for the Mamas, a decent changing bag. I have always been a sucker for a stylish bag and because I birthed a child, that didn't change. In fact it probably intensified when I saw the world of baby changing bags, there was actually more to this market than the crappy freebie Boots gave you if you redeemed your Emma's Diary coupons? I stumbled upon Pacapod when I began working for Mummy and Little Me, and I've never looked back, a couple of other brands have pricked my interest here and there but I always fall right back into the Pacapod hold. Why? Because it's a good one filled with roomy changing bags that consider Mum just as much as baby. I think when we become first time parents, we need little hybrid items like this that help us maintain our identity, it's so easy to become overwhelmed in a world of nursing bras and sudocrem. I've owned one of my Pacapod bags for close to four years now, and it's aged like a fine wine, barely looking any older than the day it arrived on my doorstep. If I'm asked what changing bag I recommend, Pacapod all the way. Muslin swaddles are firmly up here in my top list, Aden and Anais muslins to be exact. With Noah, I realised early on how useful muslins were and I can't even count how many little three packs we purchased from supermarkets, £3.50 a pop, what I can tell you is how many we saved to reuse with baby number two - zilch. They were all either stained, really rough in texture after too many washes, or generally really crappy looking. Yet here I am, with a one year old and the same 8 muslins from Aden and Anais that I purchased before he was born, looking as good as they did then. If anything, they're softer the more they are washed, they are also bloody huge meaning a muslin or swaddle has not been their only use, oh no. We've had sun shades, picnic blankets, actual blankets, and pillows fashioned out of these magnificent things. I know the price tag can be a little off putting but my word they are so absolutely worth every penny. Lastly, a close rival to my most used product at the top, is a decent camera. We're in a digital age, there is no hiding that, certainly on my part anyway. I love taking snaps of my boys, I'm not one to head out into the fields and stage a full blown photo shoot, after all I am no budding photographer. Though I am guilty of constantly snapping away at them, but it's a guilt I'm happy to be burdened with for the repercussions are far outweighed with the benefits. I get to reflect on some truly magnificent memories with my sons, one's that I can forget that are happening right before my eyes. In years to come I wont remember those tender moments I've captured this year, but the snaps will transport me right back and for that I really am grateful that I have a semi-decent camera and phone to grab those memories with. I second swaddles and a camera! We used swaddle blankets to help our twins sleep and they worked a treat! I'm also guilty of taking too many photos!! I'd not heard of Whisbear! Looks lovely. I definitely wouldn't be without my camera either!! We live Little Angels nappies too! They're like a third of the price of Pampers and so much better! We are glad you love Whisbear Jeannette! we hope you will give him a go! Oh this takes me back. Muslin clothes are fantastic aren't they.